KneeBindings are the only bindings in the world with PureLateral™ heel release! This patented mechanism can detect the specific forces that cause most knee injuries on skis, and can release just before the forces are great enough to otherwise injure the knee. KneeBindings are the only bindings in the world with PureLateral™ heel release! This patented mechanism can detect the specific forces that cause most knee injuries on skis, and can release just before the forces are great enough to otherwise injure the knee. 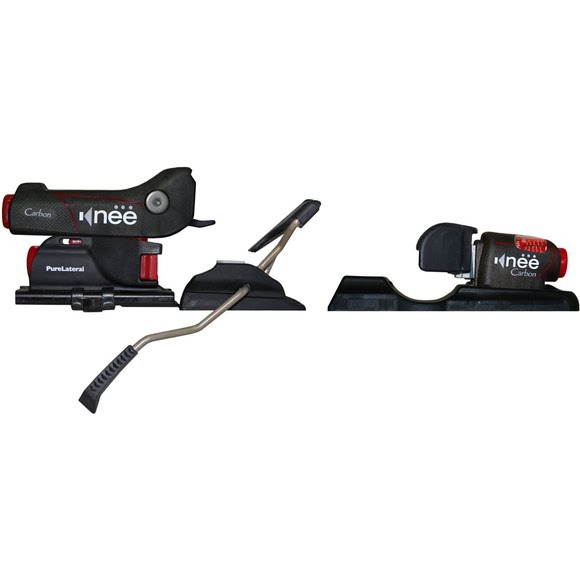 Kneebinding&apos;s Carbon DIN 3 - 12 Ski Bindings, the world&apos;s only carbon-fiber bindings blend industrial resins with hi-tech carbon fibers to increase strength and rigidity. This makes the coupling even tighter and stiffer, providing more feedback to the skier and more precise transmission of energy to the ski. KneeBindings provide a third dimension: a PureLateralTM heel release which can detect the forces that cause most knee injuries, and can release directly sideways before such an ACL injury can occur, all without pre-release issues! The only proven way to mitigate knee injuries on skis is with PureLateral heel release and only KneeBinding has it. Creates a more secure interface with better edge grip and power transfer. Kneebinding&apos;s Flex|Float system allows modern ski shapes to flex the way they were intended, improving elasticity and agility, while minimizing unwanted releases.